← UK car exports double in a decade. 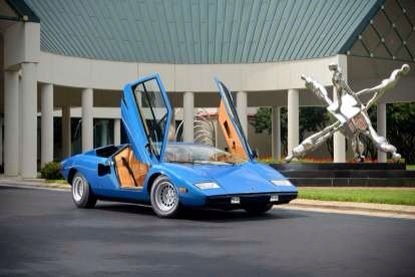 What was once a poster car for millions around the world in the 1970s went for more than $1.2 million at the seventh annual Bonhams collector motorcar auction in Greenwich, Conn. A slim-bumpered 1975 Lamborghini Countach LP 400 Periscopica went to a bidder seated in the front of the room, beating out more than a dozen telephone bidders with the sale. The car gets its name from the rearview mirror, whose housing pokes up on the roof, and is one of the first 150 made. It also has only about 10,000 miles on it. Jacksonville’s Pedals and Paws Benefit Car Show on June 7 at Mandarin’s Riverplace Shopping Center generated $1,500 for Ana’s Angels Animal Rescue. And, while it was hosted by the Jaguar Car Club of North Florida, there was a variety of cars represented among the 42 vehicles at the event. Dogs, meanwhile, were adopted at an adoption fair at the nearby Petco. Among the show winners: Best of Show — Robert Ramey’s 1967 Ford Cobra; Best WOW FACTOR — John Schlier’s 1966 Corvair Corsa; People’s Choice — Jermaine Roland’s 1962 Ford Fairlane; Anna’s Angels award — Jason Hayes’ 1962 Corvette; Best American Car — Kenneth Byrd’s 1965 Ford Mustang; and Best Foreign award — Lance Brazol’s 1980 Triumph Spitfire. Remember when your mother told you to clean up all the toy cars? Well, you can tell Mom about the world record for the longest line of toy cars that was just certified after occurring May 5 at The National Motor Museum in Beaulieu, England. It took 10 hours to place 24,189 toy cars nose to tail in a snaking 1.2-mile-long line around the museum and its grounds. That beat the existing Guinness World Record of 14,310 toy cars set in Füssen, Germany. One toy was donated by Pink Floyd drummer and classic car racer Nick Mason; racer Sir Stirling Moss donated a model of the Mercedes-Benz 300 SLR in which he won the 1955 Mille Miglia race. The last two cars in the lineup were signed models of Bloodhound SSC and Thrust SSC land-speed record cars donated by record-breakers Wing Commander Andy Green and Richard Noble. The cars were sold to raise money for Naomi House hospice. This entry was posted in automotive, National Motor Museum and tagged Beaulieu, chrismacgowan, christopher macgowan, Lamborghini Periscopica, Nick mason. Bookmark the permalink.